The Office of Foreign Asset Control (OFAC) has defined a list of countries that you are advised against participating in transactions with users from that area. 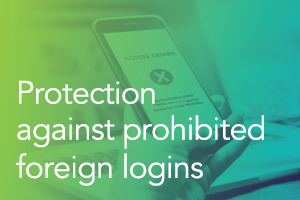 Depending on your customer composition and level of global commerce, your financial institution may want to prohibit certain foreign logins. To help, Q2 now provides a service to restrict login access to those regions.